4L280 FHP V-Belt | Light Duty 4L-280 V Belt, Consumer Brand. 4L280 FHP V-Belt. 1/2” W x 28" Overall Length. Consumer Brand. GATES 2280/4L280 Truflex V Belts. 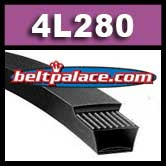 Classical A26 V Belt on light duty applications. Belt for Harbor Freight/Chicago Electric Model 46225 (10" Tile Saw belt).